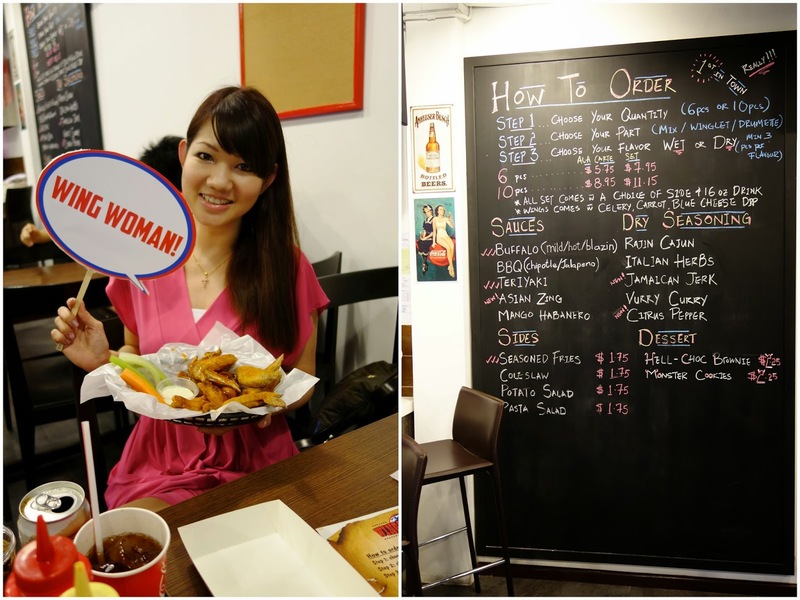 PinkyPiggu: Wings World ~ New Specialty Restaurant at East Coast Road Is All About Wings, Wings & More Wings! It is an understatement to say that I like chicken wings, the fact is.. I love it! With more than 10 different flavors (and more to come soon) vying for our affection at Wings World, there is certainly no lack of choices. The question is: Which flavors shall we accord our love to? Should we choose the wet ones tossed in a variety of sauces such as Buffalo, BBQ, Teriyaki, Asian Zing, Mango Habanero, or those coated with dry seasonings like Rajin Cajun, Citrus Pepper, Italian Herb, Vurry Curry, Jamaican Jerk? The variety of sauces and seasonings which are all homemade from scratch using over 75 quality spices, herbs and ingredients sure sounds titillating to the tastebuds. After much deliberating, we finally reached a consensus and placed our orders. The deep-fried wings arrived nested in their baskets, but poor things, they looked so skinny. Our table wasted no time in quickly giving them their farewell photography shoot before they disappear in our tummies forever. While the dry seasoning of Vurry Curry and Italian Herb were distinct in flavor, it was let down by the lack of succulence in the meat. I would also prefer my wings to be fleshier (plump it up yo!). The skin was crisp though, and lovely to bite. Mango Habanero was sweet with a slight tang, but carried none of the fiery complexity it should have. We almost did not order the Buffalo wings, but I’m glad we eventually did, for it turned out to be the tastiest that evening. It came in four levels of spiciness: Mild, Medium, Hot and Blazin. We thought hot should be hot but apparently it’s not hot enough. We should have gone for the Blazin! Overall, we find the wet saucy ones fared better in terms of combined texture and flavor. The chicken wings can be ordered in 6 pieces (ala-carte $5.75 / set $7.95) or 10 pieces (ala-carte $8.95 / set $11.15) in your preferred Winglet, Drumette or a Mix of both. Party Platters are also available for takeaways in 50 pieces ($45.95) and 100 pieces ($89.95). Simply call to pre-order, and if parking space is an issue, just drive up to the restaurant and the staff will swing over with your order! Wings World call it the curbside pickup service! Very convenient I must say! Vibes are casual in this restaurant and the interior seems to be designed with an aim to emulate an America-style diner. Not quite there, but still, if you're looking to try some tastes different from your usual chicken wings, Wings World's wide variety of flavors might just suit you. I love chicken wings too! Feel like ordering all the seasonings they have at one go!